At the time of its construction, the William Herschel Telescope (WHT), located on La Palma, in the Canary Islands, Spain was an impressive technical behemoth. In 1987, it was the third largest single-optical telescope in the world with a mirror measuring almost 14 feet (4.2 meters) in diameter. Its massive size and location in the Northern Hemisphere offered researchers an opportunity to glimpse into the previously unseen. WHT has captured the first evidence of the existence of supermassive black holes, as well as the first observation of a gamma-ray burst. 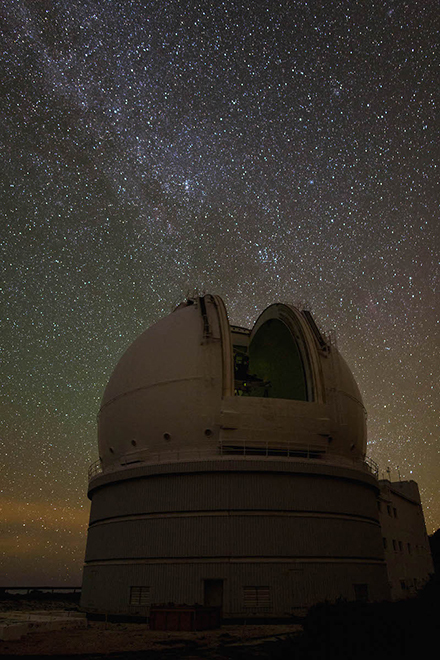 “William Herschel Telescope, Roque de los Muchachos Observatory, Canary Islands, Spain” Image Courtesy of Ana García – AstroLaPalma, and the Isaac Newton Group of Telescopes, La Palma. Although larger, more technologically-advanced telescopes have come into existence, WHT has become a hotspot for testing new equipment in recent years. A new collaborative project called WEAVE is capitalizing on the telescope's versatility. 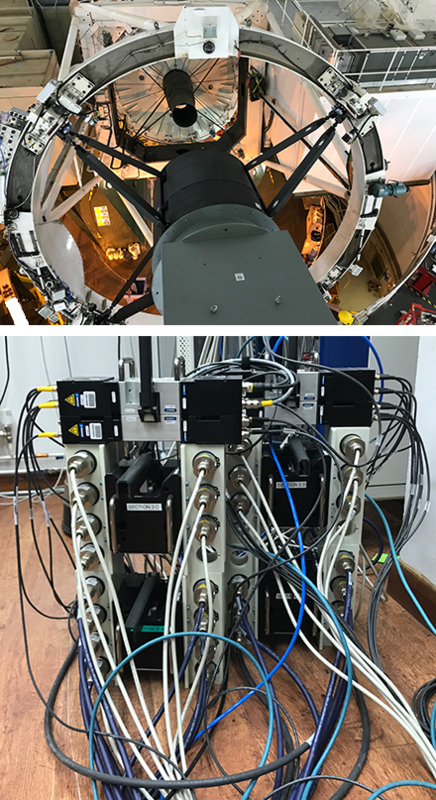 Led by Professor Gavin Dalton, researchers from the University of Oxford are working with teams from France, Italy, Netherlands, Spain, and UK on a wide-field spectrograph; the data collected will create a map of the galaxies. Using a new automated system alongside WHT's powerful optics, Dalton's team is able to measure detailed spectra of the stars. Not just the ones we can see shining in the night sky, but fainter, more distant stars that are only detectable in deep imaging. Mapping the galaxies is more than just an exciting hobby. WEAVE will document the spectra of 10,000,000 stars during the project's timeline. The spectra reveal the Doppler shifts caused by motion of the stars relative to our sun, which combine with satellite measurements to explain the full 3-dimensional motions. The information gathered by the spectrograph will help researchers like Professor Dalton uncover secrets about how stars and galaxies form and provide insight into the origin of the universe. Like any automation project, time and space considerations presented extraordinary challenges. Stars are only visible during part of the night, and the telescope has a large, but still limited, 2-degree field of view; the team needed a robotic system for WEAVE that could quickly but efficiently assist in repositioning 1,000 optical fibers every hour to prepare for the next observation. They would also need a way to traverse the enormous work area and connect utilities to the instrumentation. WEAVE uses multi-object spectroscopy to capture a wide-field view of the galaxy. The automated fiber positioning system utilizes two robotic arms to place 1,000 individual fibers for each observation of the sky. The fibers match the locations of stars within each observation area to ensure the team is gathering relevant data and not just empty sky. The light captured by the fiber positioned on each star is fed to the spectrograph to produce an individual spectrum. As one set of fibers is staged for the next observation, the other set feeds data to the spectrograph as the current observation is in process. The resulting spectrum will tell researchers the temperature of each star, its composition, how fast it is moving, and whether it is moving towards or away from the Earth. Most industrial applications suffer from a lack of space, whereas the large work envelope of the WEAVE project created some difficulties. Dalton’s team partnered with ATI Industrial Automation for help connecting their equipment. The WEAVE spectrograph and the fiber positioner, although joined by the large moving structures of the telescope, are situated more than 100 feet (30.48 meters) apart. To connect the required motor power, network, monitoring, and encoder signals, and compressed air, ATI developed a set of six pairs of custom-configured Utility Couplers with attached Gigabit Ethernet Modules and specially-engineered Servo Modules. Featuring 64 custom-length cables in three sections, these manually-actuated Utility Couplers were ideal for this project as it required a quick, secure connection of multiple utilities that could be achieved without the use of a drive cylinder. ATI carries a full line of standard and manually-actuated Utility Couplers and Utility Modules; however, solutions can be engineered to meet customer's exact needs. For the WEAVE Project, additional cable length allowed Professor Dalton and his team to bring utilities to project components despite the vastness of the workspace. Another critical measure was to eliminate crosstalk between the 430V motor drive signals and the microvolt encoder signals through the extra-long cables. 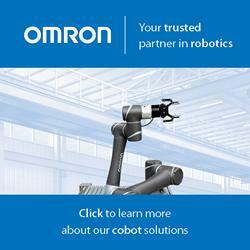 ATI's careful attention to the grounding of the cable connectors used in the custom-engineered Servo Modules prevented any issues. Tracking the spectra of distinct stars allows researchers to define physical characteristics and details of the surface chemistry. A robotic system was a natural fit for the WEAVE project; after all, robots excel at following specific directions quickly and accurately–at a rate of 1,000 stars per hour to be exact. ATI's Utility Couplers along with Gigabit Ethernet and custom Servo Modules provided efficient and safe routing of multiple utilities to the system without crosstalk. In this innovative application, WEAVE deploys industrial technology to further astronomical discovery. This incredible effort has taken many years to come together, with contributions from the Netherlands and the UK, Italy, France, and Spain. By working as a team, these entities have developed technology that will help us better understand our universe. ATI is extremely proud to play a part in the WEAVE project.